If you’re looking to pay less than $20 a month for data on your smartphone, you’ll soon have just one choice left among the biggest post-paid U.S. carriers: T-Mobile. And while pricier 3G and 4G data plans do—on paper, anyway—offer more bang for your wireless buck, chances are you’re not using enough mobile data to reap any real benefit. That leaves T-Mobile as the sole, nationwide U.S. carrier with a sub-$20 monthly data plan for smartphones. For $10 a month, you can sign up for T-Mobile’s “Simple” data plan, which offers 200MB of data per month. The next cheapest smartphone data option for new customers is AT&T’s new Data Plus 300MB plan, which serves up 300MB for $20 a month. After that, the smartphone plans from the biggest U.S. carriers, including AT&T, Sprint, T-Mobile, and Verizon Wireless go up and up. 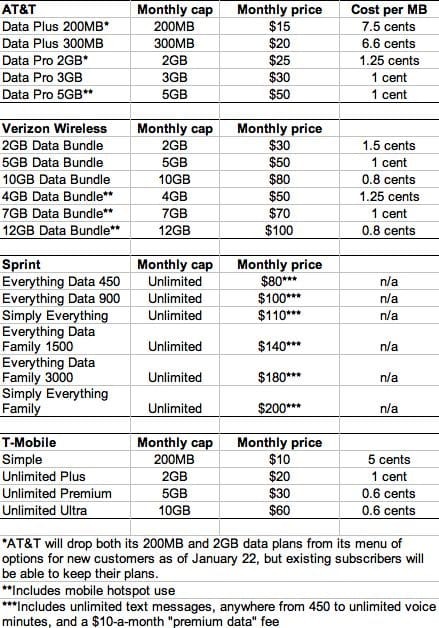 Verizon’s cheapest smartphone data plan, for example, goes for $30 a month for 2GB, while Sprint—the last big U.S. carrier with a truly unlimited data plan for smartphones—offers nothing but unlimited data bundles, starting at $80 a month (including a $10-a-month “premium data” fee) for all-you-can-eat data, 450 voice minutes, and unlimited text messages. Of course, the pricier the data plan, the more bang you get for your wireless buck—well, theoretically, anyway. Related: How big is a GB, anyway? Indeed, one of the worst values among the smartphone data plans in my little survey is among the cheapest: AT&T’s soon-to-expire, $15-a-month Data Plus 200MB, which comes out to a relatively hefty 7.5 cents per megabyte. AT&T’s new Data Plus 300MB plan offers a slightly better value at 6.6 cents a MB, but that’s more than a cent and a half per megabyte higher than T-Mobile’s competing $10-a-month, 200MB “Simple” data plan. And the more you spend, the better the value. AT&T’s Data Pro 5GB plan offers 5GB of monthly data, plus the ability to use your smartphone as a mobile Wi-Fi hotspot (more on that in a moment), for $50—or a cent per megabyte. Up the ante even more, and the value gets better. Take Verizon’s $80-a-month 10GB data bundle, which comes out to 0.8 cents a megabyte, or T-Mobile’s “Unlimited Ultra” plan, which delivers 10GB of “high speed” data for $60 a month, or just 0.6 cents per MB. But here’s the thing: getting great value per MB on a 10GB, 5GB, or even 2GB monthly data plan doesn’t mean much if you’re not using all your monthly data. And according to a Consumer Reports survey from last summer, most of us don’t even come close. Related: Which data plan should I get for my iPhone? In fact, the survey found that the average smartphone user on AT&T consumed only about 360 MB of data a month. And when considering only “median” smartphone data use (or the largest group of users in the middle of the range), the figure for monthly AT&T data usage fell to a mere 120 MB, well shy of the 3GB data cap on AT&T’s new $30-a-month, 3GB Data Pro plan. That’s why it’s worth checking your monthly bill or calling your carrier to see just how much data you’re using on your smartphone each month. Are you using less than 300MB or 200MB of wireless data a month? If so, you might be better off with a cheaper data plan, even if it doesn’t offer the same value per MB as a pricier option. And if you’re using 2GB or more data a month, then hey—time to cash in on the values offered by pricier data plans. The good news is that most carriers will let you change your monthly data plan even if you’re still under contract; the bad news, though, is that you might not have many bargain options, particularly if you’ve signed up with Sprint or Verizon. 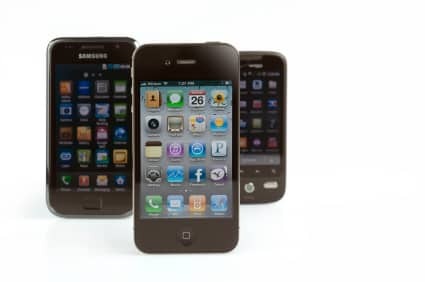 There’s yet another key variable to consider when it comes to picking a smartphone plan: overage charges, which you can read about right here. Got smartphone questions? Post ’em below!